What is the Competitive Forces Model? Competitive forces model is an important tool used in a strategic analysisStrategic AnalysisStrategic analysis refers to the process of conducting research on a company and its operating environment to formulate a strategy. The definition of strategic analysis may differ from an academic or business perspective, but the process involves several common factors: Identifying and evaluating data relevant to the to analyze the competitiveness in an industry. 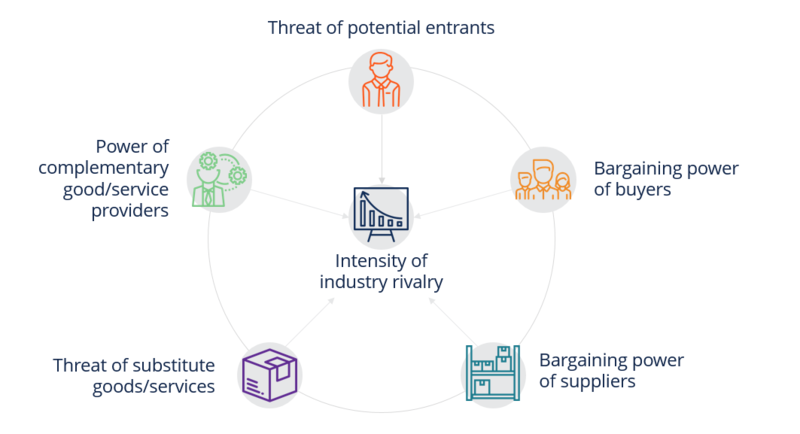 This model is more commonly referred to as Porter’s Five Forces Model, which includes five forces — intensity of rivalry, threat of potential new entrantsThreat of New EntrantsThe Threat of New Entrants refers to the threat that new competitors pose to current players within an industry. It is one of the forces that shape the competitive landscape of an industry and helps determine its attractiveness. Other forces are competitive rivalry, bargaining power of buyers, threat of substitutes,, bargaining power of buyersBargaining Power of BuyersThe bargaining power of buyers, one of the forces in Porter’s Five Force Industry Analysis Framework, refers to the pressure that customers/consumers can, bargaining power of suppliersBargaining Power of SuppliersThe Bargaining Power of Suppliers, one of the forces in Porter’s Five Forces Industry Analysis Framework, is the mirror image of the bargaining power of buyers and refers to the pressure suppliers can put on companies by raising their prices, lowering their quality, or reducing the availability of their products, and threat of substitute goods and/or services. In our competitive forces model, we include a sixth force, power of complementary goods and/or services providers. This model helps company understand the risks in the industry it is operating in and decide how it wants to execute its strategies in response to competition. There are multiple factors which can impact the intensity of rivalry within an industry. Network effects – refers to the positive effect on the value of a product when there is an additional user of the product. When a network effect exists, the value of a product or service increases as more people are using it. Complimentary goods or services can add value to the existing products in an industry. However, when complements have unattractive features or do not provide any value to consumers, they can actually become an issue for the industry by slowing growth and limiting profitability. When developing strategies for a business, decision makers should consider how they can potentially encourage complement providers to integrate and become a part of the business. Successful integration with complement providers is likely to expand market opportunities and bring profit-enhancing benefits to the business. Thank you for visiting our resource on competitive forces model. To learn more about external analysis and how to perform strategic analysis, enroll in our Corporate & Business Strategy course today!